Critics say the proliferation of affordable, easy to use cameras has cost photography some of its artistry. Local award winning photographer, Howard Moo Young, believes that needn’t be the case. Moo Young will teach students to develop their artistic skills in The Art of Photography: Learning to See, a course he will teach in August at the Caribbean Institute of Media and Communication (CARIMAC). covers news, sports and action. 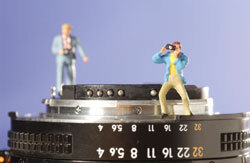 I cover architectural, aerial, underwater, creative, nature, medical and forensic photography. A lot of people don’t realize the wide scope of professions offered in photography. A: It’s one of the hardest, most difficult things to teach. If each student brings an album or portfolio, I can go through the album and tell which person has the gift to do it. I teach them to walk around the subject, look for angles, lighting, colours, and contrast. You can start ‘learning to see’ right in your backyard. I’m not tired of emphasizing it. That is the key thing in photography. A: You have to learn the art of photography, learn to see. It doesn’t matter if you are using an expensive or cheap camera; it’s the person behind the camera. You have to become an artist. The lighting; artificial or ambient, the texture; how you design inside your camera or the photograph you’re going to take. The composition is key. I’ll talk about the different lenses; I’ll touch on things like nature, animals and flowers, people at work, people at play, people at home. A: The best film quality up to now, I’m not saying it because I’m biased, is film photography: 35mm transparent photos, you can blow those up. Digital photography can still give you the same quality up to a certain size; you have to use accessories to beef it up to what you want. The digital print from a digital camera looks almost artificial as opposed to film.